This isn’t a problem, per se, with the PolicyPak CSE. This is a problem with the MSI database that contains the contents of what is registered or not. One QUICK FIX we have seen is: Rename the NEWEST CSE you get from us to something unique. For instance, PolicyPak-CSE-SETUPx64-BUILD12345.MSI, then re=try your upgrade. We have reports that this “magically fixes it” by fooling the MSI database. You might see a dialog similar to this when trying to uninstall. 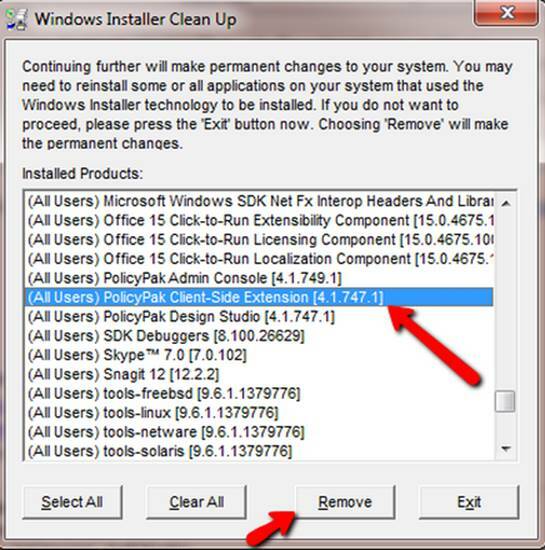 And, even if we (PolicyPak) provide the previous version to you, its still likely that the CSE wont uninstall. 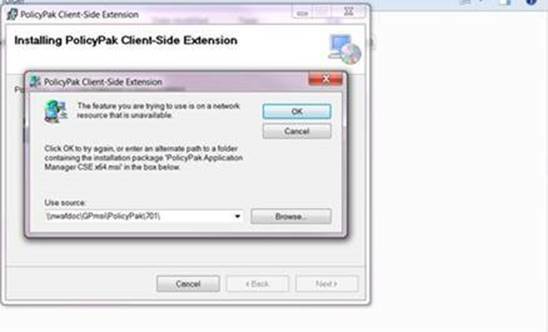 Then manually install the latest PolicyPak CSE, and verify it worked as expected. You’re going to test a SCRIPT version of that on SOME machines. You’re going to then try to deploy the new CSE to SOME machines. Then you’re going to run the script on the REMAINDER of your machines. Then you’re going to deploy the new CSE to the REMAINDER of your machines. There is a FREE and PAID version of the tool; you can use either. Download our MSIZAP and batch file. MSIZAP is a command line version of MSICUU that you used in Step 1. The included is a batch file which will perform the uninstall…using MSIZAP. It only works if you put the OLD versions in some place it can find it. You’ll see if you open up the Batch file which is much clearer. TIP:If the batch file needs updating and doesn’t contain the MSI codes for the version you are trying to uninstall, please work with your support rep who can get that updated for you. Manually test the batch file on a handful of machines. DO try PDQ Deploy to get the latest CSE on those endpoints. THEN continue to use PDQ deploy to get the rest of the machines CSEs installed. There’s no downside in renaming the latest CSE to be a unique name while attempting your upgrade. This might yield more success, according to at least one customer report.